Upcoming Art of Psychiatry meeting – “James Tilly Matthews and the Influencing Machine” with Mike Jay – Thurs Feb 23 6pm R Murray B IoPPN – all welcome! Venue: Robin Murray B Institute of Psychiatry, Psychology and Neuroscience. Please join us for a speaker meeting concerning the fascinating case of James Tilly Matthews. James Tilly Matthews was a former peace activist of the Napoleonic Wars. He was confined to the Bedlam asylum in 1797 for believing that his mind was under the control of the “Air Loom” – a terrifying machine whose mesmeric rays and mysterious gases were brainwashing politicians and plunging Europe into revolution, terror, and war. But caught up in high-level diplomatic intrigues in the chaos of the French revolution many of the conspiracies in which Matthews claimed to be involved were entirely real. 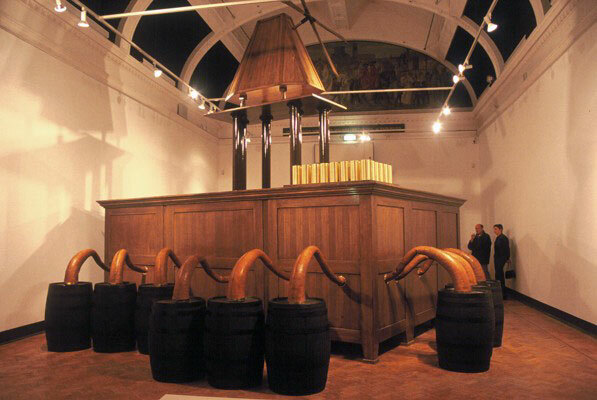 Matthew’s “Influencing Machine” has recently been materialized by artist Rod Dickinson, and is currently on view at the Bethlem Gallery. Mike Jay is a historian, curator and writer. His recent book is This Way Madness Lies, a highly illustrated history of madness and the asylum, published in the UK and USA by Thames & Hudson. It was written in conjunction with Wellcome Collection’s exhibition Bedlam: the asylum and beyond, on which he was guest curator. His previous book, The Influencing Machine, is out in paperback and on Kindle. He reviews regularly for the London Review of Books, the Wall Street Journal and the Literary Review. About the Air Loom in the Bethlem – www.theairloom.org.